Before the Roman Republic came into existence, Rome was ruled by seven kings. It is assumed that each of these kings ruled for the duration of 35 years. Roman historians such as Livy (64BC to 17AD) had recorded the past of these ancient kings which is regarded as the legend of ancient Rome. It was said that the city of Rome was founded by Romulus, who also ruled as its first king. The most interesting among these seven kings was Ancus Marcius (640-616 BCE). Ancus Marcius was the son-in-law of Romulus’s great-grandson ‘Tullus Hostilius’. Ancus waged war against the Latins which is also considered as the first war waged by the Roman by the process of fetials (priesthood). He established the first prison in Rome, the Mamertine Prison and also established port Ostia at the mouth of the River Tiber. The kings of ancient Rome were selected by the Senate but King held absolute power over the people and armed forces. 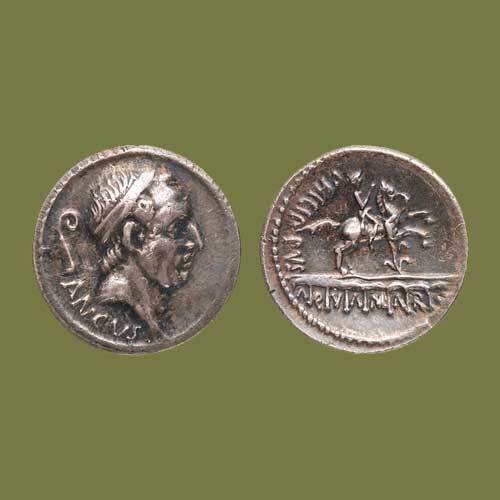 The above shown silver denarius of moneyer L. Marcius Philippus issued in 56 BCE depicts the portrait of King Ancus Marcius with inscription ‘ANCVS’ on the obverse. The reverse of this coin depicts equestrian statue above the aqueduct bridge with the initials of moneyer. The reverse also commemorates the construction of Rome’s first aqueduct, Aqua Marcia. Ancus Marcius was succeeded by Lucius Tarquinius Priscus who was later-on assassinated by Ancus’ sons. The Patrician Marcius Rex family- a descendant of the fourth king remained prominent during the Roman Republic and Empire. The insignia of the ancient Roman king was 12 lictors wielding the fasces, throne of a curule chair, the purple Toga Picta, red shoes and a white diadem.